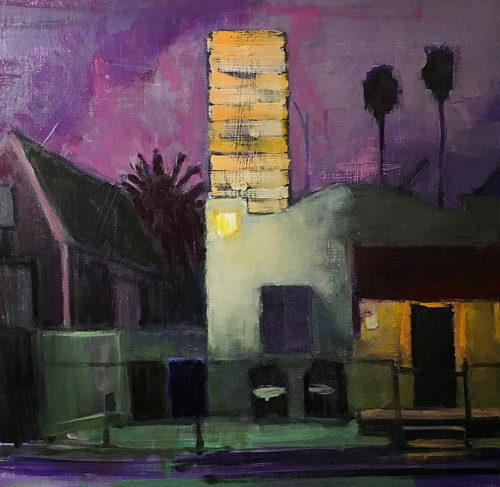 This entry was posted in Daily and tagged banker's hill, palm tree, san diego on March 1, 2019 by Kevin. Storm rolling in off the Pacific at the Dog Beach in OB. 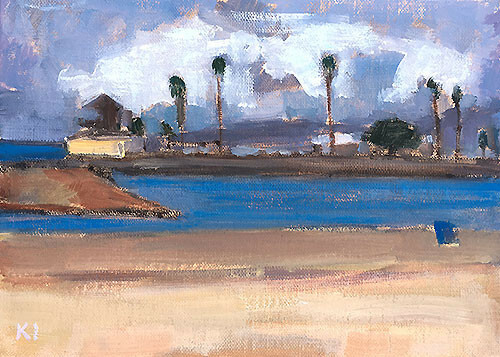 This entry was posted in Landscape Paintings, San Diego Paintings, Seascape Paintings and tagged 5 x 7 inches, dog beach, ocean beach, oil on linen on panel, palm tree, san diego on November 18, 2015 by Kevin. 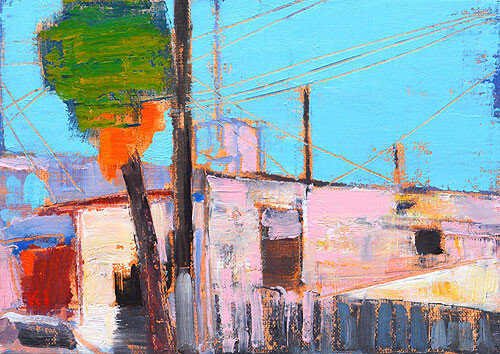 This entry was posted in Landscape Paintings, San Diego Paintings, Urban Landscapes and tagged 5 x 7 inches, landscape, oil on linen on panel, palm tree, sky wires, tijuana, urban on August 26, 2015 by Kevin. 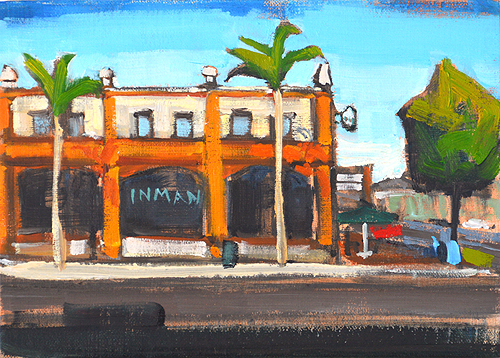 Painted in OB today as the storm rolled in. 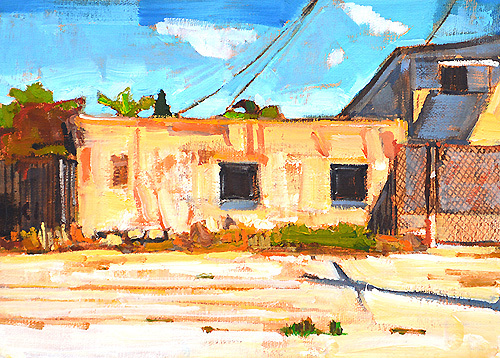 This entry was posted in Landscape Paintings, San Diego Paintings, Urban Landscapes and tagged 8 x 10 inches, alley, ocean beach, oil on linen on panel, palm tree, plein air, san diego on May 14, 2015 by Kevin. 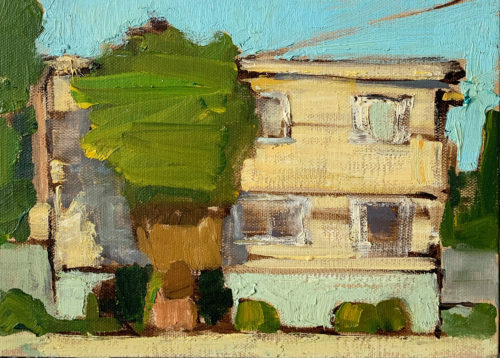 This entry was posted in Landscape Paintings, San Diego Paintings, Urban Landscapes and tagged 5 x 7 inches, california, city, OB, ocean beach, oil on linen on panel, palm tree, san diego, street on May 1, 2015 by Kevin. 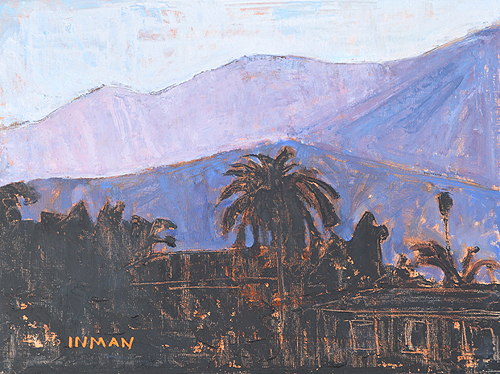 Painted on location in Balboa Park. 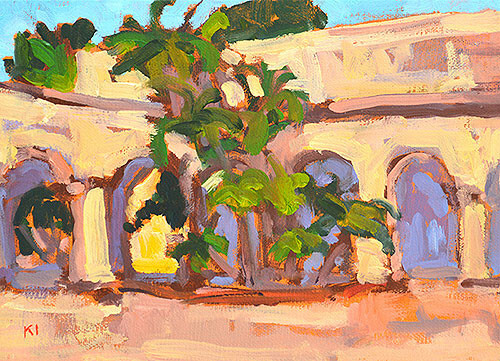 This entry was posted in Landscape Paintings, San Diego Paintings, Urban Landscapes and tagged 5 x 7 inches, archways, balboa park, california, oil on linen on panel, palm tree, san diego on April 7, 2015 by Kevin. From the “Bridge of Flowers” in Irvine, which I think of as the Cat Piss Bridge. 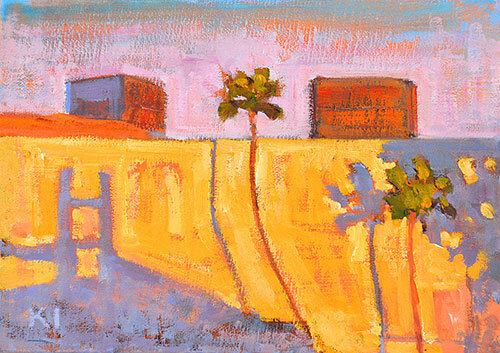 This entry was posted in Landscape Paintings, San Diego Paintings, Urban Landscapes and tagged 5 x 7 inches, california, irvine, los angeles, mall, oil on linen on panel, palm tree, san diego on January 17, 2015 by Kevin. 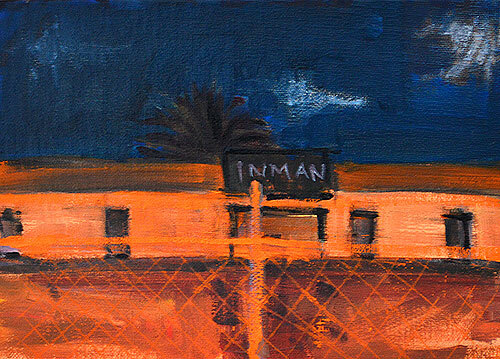 This entry was posted in Landscape Paintings, San Diego Paintings, Urban Landscapes and tagged 5 x 7 inches, california, city, palm tree, san diego, watercolor on January 11, 2015 by Kevin. A restaurant going up by the harbor. 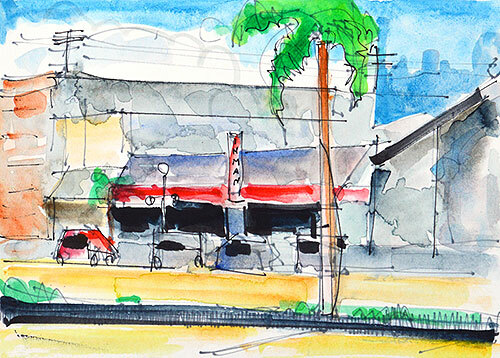 It was a steamboat restaurant- I heard a strange story that the steamboat sank, but that’s probably an urban legend. 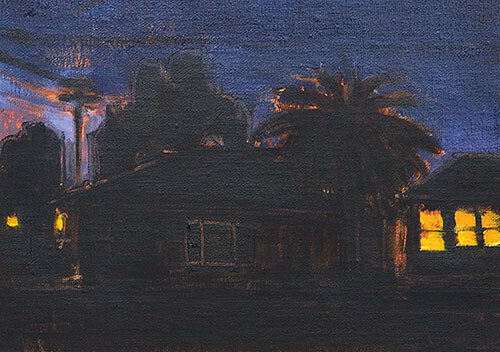 This entry was posted in Landscape Paintings, San Diego Paintings, Urban Landscapes and tagged 5 x 7 inches, california, construction site, industrial, night painting, nocturne, palm tree, san diego, urban on December 12, 2014 by Kevin. Middle of the day. North Park. 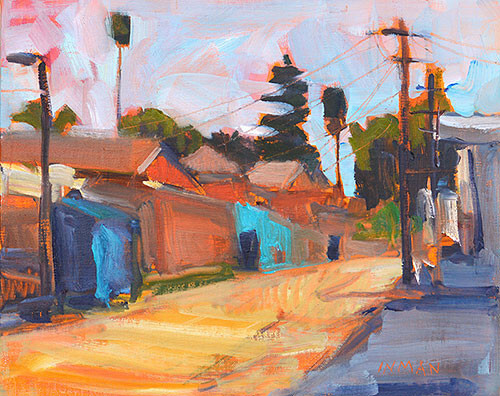 This entry was posted in Landscape Paintings, San Diego Paintings, Urban Landscapes and tagged 5 x 7 inches, alley, california, north park, oil on linen on panel, palm tree, power lines, san diego, sunny on November 6, 2014 by Kevin. 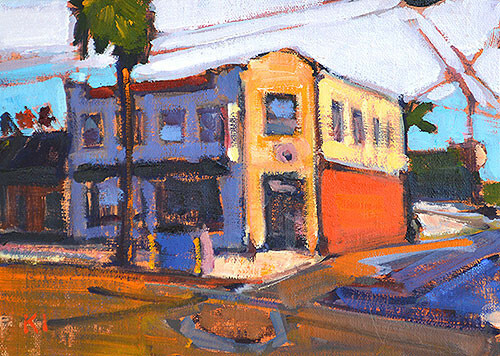 This entry was posted in Landscape Paintings, San Diego Paintings, Urban Landscapes and tagged 5 x 7 inches, birch theatre, california, city, north park, oil on linen on panel, orange, palm tree, san diego, starbucks, street, urban on October 10, 2014 by Kevin. 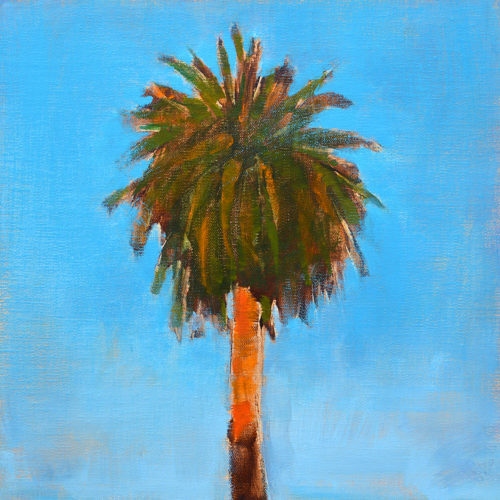 This entry was posted in Landscape Paintings and tagged 12 x 16 inches, california, landscape, montecito, mountain, oil on linen on panel, palm tree, santa barbara on October 7, 2014 by Kevin.